There's no place on earth like Detroit. And there's no campus on earth like Wayne State. We're located in Midtown, the city center and one of the country's fastest growing neighborhoods. On campus, you'll find 200 acres of green space, walking paths and state-of-the-art facilities surrounded by renowned cultural institutions and industry-leading employers. Every day, Wayne State students and faculty participate in the reinvention of a great American city as they live, learn, work and play in the heart of Detroit. 340 businesses, including 57 retail and clothing stores, 81 restaurants and bars, 6 grocery stores and 4 hotels. 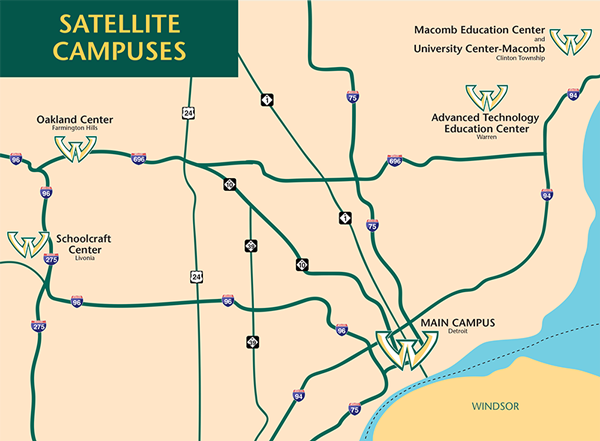 Even though we're headquartered in Detroit, five satellite campuses throughout Southeast Michigan make a Wayne State education accessible to students who want to complete their degrees close to home and work. Other universities offer a semester in Detroit; we offer every semester in Detroit.